It’s BEEN described as one of the most successful comedies ever staged and once you’ve seen it, you can see why it holds that accolade. Having opened in 1996, it took both the West End and Broadway by storm, won the Olivier, Tony, Molière and every other major theatre award, and has been packing in audiences worldwide for more than twenty years. Serge spends a huge amount of money on a modern painting, his best friends, Marc and Yvan are in two minds about it. Marc instantly dismisses the painting as rubbish, but Yvan sees potential in the art, turning the whole play on it’s head and making the focal point on friendship rather than the art itself. 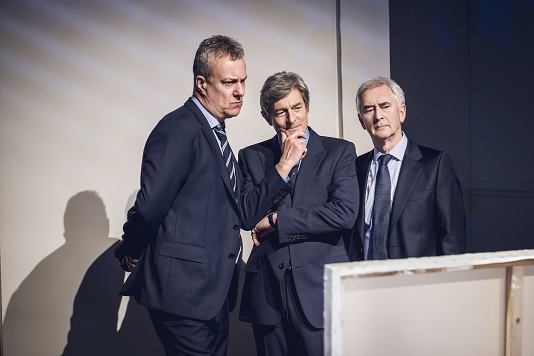 The all-star cast features BAFTA-nominated Nigel Havers as Serge, Olivier Award-winning Denis Lawson as Marc and British Comedy Award-winning Stephen Tompkinson as Yvan. The quick witted remarks from all three cast members will leave you holding your sides for the pain of laughing, but the overall top prize has to go to Stephen Tompkinson for his amazing performance. Not only, did he play his part with utter brilliance, a master of timing and facial expressions without the need for words. He also seemed to speak the words of frustration, everyone in the audience could relate to. A story centred around a sole piece of artwork which is effectively a blank canvas, stirs up hilarious remarks which are relatable and believable at every turn. The fascinating use of minimal props and scenes with the same table and three chairs, changing a simple piece of art so instantly the audience knows the place, is very clever too. A top cast and a top play, one not to miss this winter season.